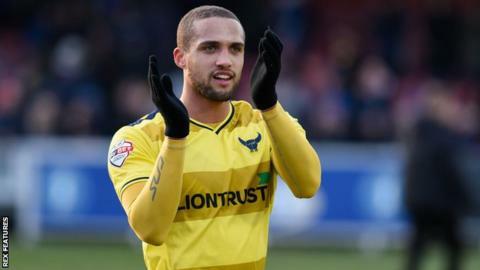 Oxford United won at home in the league for the first time in 2016 against relegation-threatened York. Jordan Bowery netted, via his kneecap, after Callum O'Dowda's fierce shot was parried by goalkeeper Michael Ingham. Ingham kept the hosts at bay before Chey Dunkley's header from a debatable corner extended Oxford's lead. Danny Hylton then grabbed an exquisite individual goal before Kemar Roofe's top-poke saw him score his 20th goal of the season. Victory saw Oxford move ahead of Plymouth into second and Hylton's goal was the pick of the night - with the 27-year-old lifting the ball over a defender before taking a touch and curling the ball into the bottom corner. York remain two points adrift of safety despite Ingham pulling off a number of saves when the score was still at 1-0. "I'm angry at how the game finished. "I thought we had our best spell in the game just before the second goal, which came from a corner but it was clearly our ball. Saying that, we should have the ability to deal with it. "Once the second goal went in our heads dropped and that reflected in the last bits of our game. "They're a good side and they can smell blood at that point, and they pushed on." Match ends, Oxford United 4, York City 0. Second Half ends, Oxford United 4, York City 0. Foul by Liam Sercombe (Oxford United). Foul by Jordan Evans (Oxford United). Attempt saved. Jonjoe Kenny (Oxford United) right footed shot from outside the box is saved in the centre of the goal. Goal! Oxford United 4, York City 0. Kemar Roofe (Oxford United) right footed shot from the left side of the box to the bottom right corner. Substitution, Oxford United. Jordan Evans replaces Joe Skarz because of an injury. Delay in match Joe Skarz (Oxford United) because of an injury. Corner, Oxford United. Conceded by Luke Hendrie. Goal! Oxford United 3, York City 0. Danny Hylton (Oxford United) right footed shot from the left side of the box to the bottom right corner. Corner, York City. Conceded by John Mullins. Joe Skarz (Oxford United) is shown the yellow card for a bad foul. Daniel Galbraith (York City) wins a free kick in the defensive half. Substitution, York City. Daniel Galbraith replaces James Berrett. Goal! Oxford United 2, York City 0. Cheyenne Dunkley (Oxford United) header from the centre of the box to the bottom right corner. Attempt saved. Kemar Roofe (Oxford United) header from very close range is saved in the top centre of the goal. Attempt missed. Russell Penn (York City) right footed shot from outside the box misses to the right. James Berrett (York City) wins a free kick on the right wing. Substitution, Oxford United. Kemar Roofe replaces Alexander MacDonald. Hand ball by Callum O'Dowda (Oxford United). Dave Winfield (York City) wins a free kick in the attacking half. Corner, Oxford United. Conceded by Dave Winfield. Attempt blocked. Callum O'Dowda (Oxford United) right footed shot from a difficult angle on the left is blocked.